TAIYUAN -- China on Monday launched a remote-sensing satellite, "Yaogan V," from the Taiyuan Satellite Launch Center in north Shanxi Province. The satellite was launched with a Long March-4B carrier rocket at 11:22 a.m., the center said. The satellite will be used for data collection and transmission involving land resources surveys, environmental surveillance and protection, urban planning, crop yield estimates, disaster prevention and reduction and space science experiments. Its predecessor, "Yaogan IV," was launched from the Jiuquan Satellite Launch Center in northwestern Gansu Province earlier this month. "Yaogan III" was launched from Taiyuan on Nov. 12, 2007. The "Yaogan I" and "Yaogan II" satellites were launched in April 2006 and May 2007, respectively. The satellite was developed by the China Aerospace Science and Technology Corp., while the rocket was designed by the Shanghai Academy of Space flight Technology, which is under the corporation. 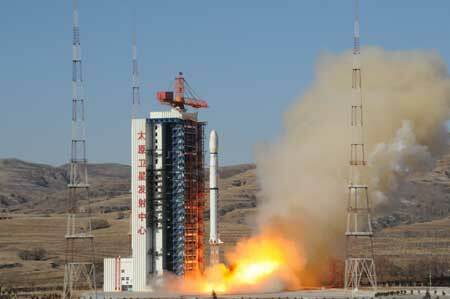 The flight was the 114th of the Long March series of carrier rockets.